Joining the Olympic View Men’s Club is a great way build a USGA handicap and to meet and compete with other Everett area golfers. The club offers an active schedule of fun golf events for men of all playing abilities. 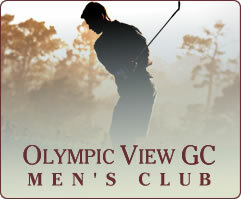 The Olympic View Men’s Club plays mostly on Sunday mornings with tournaments 2 or 3 times per month. A Men’s Club member can start competing in the Senior Club events on Wednesday mornings as well as play in the regular Men’s Club events starting at age 55. Joining at the Senior Club rates begins at age 60. You can Click Here to go to their website for applications or more information. 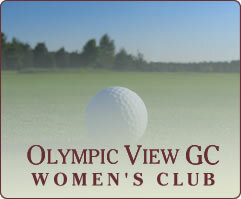 The Olympic View Women's Golf Club, started in 1972 by a group of enthusiastic golfers is still going strong. We have approximately fifty members who meet regularyly on Tuesday mornings from March until the end of October. Tee times start at 9:00am in the spring and fall and at 8:00am in the summer months. Each week there is a different competition with special events held during the golfing season. Last season a second day of golf was added to the schedule. Friday play starts in May at 8:00 am and continues until the end of October. There is no competition - just golf! Come join us, wheterh you are an experienced golfer or just getting started, we look forward to seeing you. Applications are available at the Pro Shop or on this site. You can Click Here for the application and more information.